My thanks to Jeff Keeling (above, far right) for sharing these photos of Buckeye Falls with us. I think these are the first photos I've posted on this blog that I didn't take. This is one place (among many) that I haven't been to. But my friend Jeff Miller (above, wearing yellow) made it his mission earlier this year to find the elusive Buckeye Falls and he offered these directions for the blog. Jeff found that much of the information on the Internet about Buckeye is either false or incomplete. It took him four tries, but he finally found it. In case you've never heard of Buckeye Falls, it is said to be the highest waterfall east of the Mississippi. The height listed for it varies from source to source: from 475 to 700 feet high! If you visit during dry weather, I'm told you'll mostly see just a large, wet cliff. So this waterfall is best visited in the spring or times of heavy rainfall. 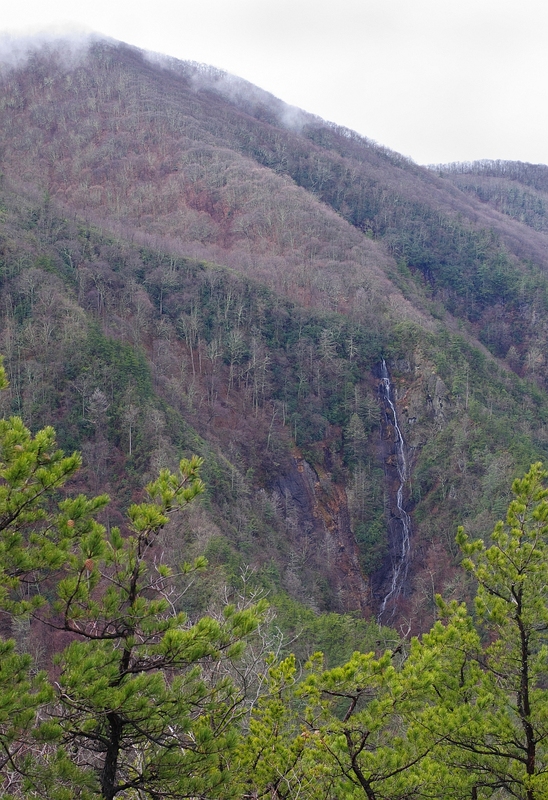 The falls are in the beautiful, but remote Clark's Creek area of Unicoi County -- and the hike is quite strenuous -- so this one should be left to more experienced hikers. 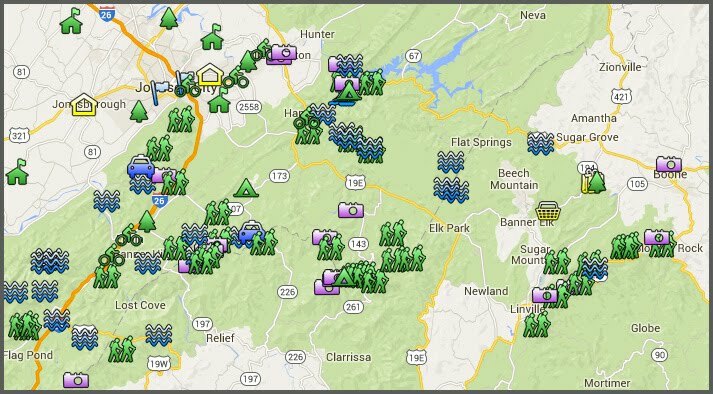 By the way, it is said that the Sampson Mountain Wilderness (where Buckeye is located) has the greatest concentration of black bears anywhere north of the Great Smoky Mountain National Park. General Info: The first half of the trail is wide and frequented by horses. You'll cross water more than 20 times and spend some time walking up the creek itself. The total distance to the falls is about 3.5 miles, and some of it is slow going. Clark's Creek is beautiful all they way; at no point is the creek out of view. 1) Drive to the end of Clark's Creek Road. It's about 4.1 miles from highway 107 to the terminus. 3) Counting this first crossing, there are 7 creek crossings in somewhat rapid succession. Between the 5th and 6th there is a side trail to the right--don't take it. 4) After the 7th crossing you'll be on the right side of the creek and will stay on that side for awhile. The trail begins to climb more, at a steeper rate than the creek. 5) The 8th crossing comes when the creek nearly catches up with the trail again (in terms of elevation). You can either descend about ten feet to the creek and then ascend about 15 feet on the other side or you can go to the right for another 50 paces or so and then cross. Going to the right will for the first time put you on a trail that is inches rather than feet wide, but this doesn't last long. I suggest this right hand jaunt, for if there's enough water you'll see a couple springs coming right out of the moss-covered far bank. They are unique and delightful. 6) When you're up the left bank you've got a relatively long span till you cross again. You'll pass more than one section where trees have fallen from the steep left-hand slopes. 7) The 9th through 12th crossings bring you into the remote area of the trail. There are no longer horse tracks, and at various points the trail is momentarily unclear, only to be seen again after several paces. 8) There's no point in counting past the 11th or 12th crossing; different hikers--even different hikers in the same party--may stay on this side or that side unequally. In addition, the creek sometimes forms little islands and therefore smaller streams which must be crossed. Just stay with the stream, and when there's an island the trail will probably follow it. 9) At what could reasonably be called the 14th crossing, the creek forks. Some websites say call the left-hand option a branch, which I suppose it technically is. The right and left, however, are about the same size. You don't want to go left. If you do, you'll be going straight up the stream and eventually come to a nice 15-foot waterfall. Getting to this waterfall is a struggle. Beyond it about 10-15 minutes is a high and narrow set of cascades. I'm convinced that some online sources wrongly consider these cascades to be Buckeye Falls. 10) Take the right branch, which is Clark's Creek proper. After a short distance (perhaps a couple hundred yards), a small branch enters from the left. 11) Go left. In the words of the local hikers who guided me there, "Go as far as you can go." It's hard to judge the distance because it's slow going. It's about a 30-minute climb, perhaps more. For much of this last leg the stream is the trail; plan to get wet. Use caution, for the higher you get the more uncertain the footing. 12) When you see the falls, there will be no doubt. People say they are often dry, but even if they are dry you'll know you're there. 13) You should favor the right side of the final approach. The falls are twice as high as they at first seem, and you'll see the top half from the right. Thanks again to Jeff Miller and Jeff Keeling for their generosity. Click here to see a beautiful shot of Buckeye Falls in the winter taken by Marty Silver. More photos and information here and here. Best info I've seen regarding Buckeye Falls. Thank you Mark! I've been wanting to find this waterfall, and this info will surely make it much easier. I tried this hike this past weekend. The directions are great, although I didn't make it to the falls. If anyone is planning to try this hike, be aware that there are several yellow jacket hive in the ground on the trail (following the directions above) somewhere around the 12th and 14th creek crossing, definately before the creek splits. Both (that I happened to walk into) were when you are to the right of the creek. I got stung several times at both hives and I think my dog was stung at the second hive which is when we turned around. I hiked to the falls in the pouring rain yesterday March 9, 2010. The directions are good. I just wish I had a camera with me. We have had a lot of rain the past week, and there was a lot of water in the creek. For those interested. I consider it a strenuous hike. I ran the majority of the way up. and it still took me one hour to get to and climb halfway up the waterfall. ON the last section, the easiest way to get up is by going strait up the creek rather than trying to stay on one side. It only took me 30 minutes to run back to my car. I think it is about 7 miles round trip. I wish this info was kept to just being word of mouth. I love these falls. I grew up in the clarks creek area and only hope that those who venture here respect the wilderness. Don't trash this area. It's beautiful and pretty untouched. So, just remember to pack out everything you pack in. Nice pics tho. For the reader who wished this info was just word of mouth, I don't think you have anything to worry about! There aren't many people who are going to complete this hike. I decided today was the day I would finally search for Buckeye Falls. 5 of us followed the directions above - which were perfect - and we found it! It rained this morning, so it was actually a true waterfall today. This is really 3 hikes in 1: 1) about 2 miles of regular trails, basically level and easy, followed by 2) one mile of hit and miss trails, hiking through the creek at multiple locations, stumbling over rocks, ducking under and around branches/trees, and getting wet - not really much of a "trail" to be honest, and 3) climbing the last half mile directly up a stream to what seemed like a near vertical ascent to the base of the falls - this was more like climbing than hiking, as parts were steep, slippery and dangerous - hands and feet type work, and very challenging at times. One thing to add to the directions - at the place where a small branch enters from the left (which you follow to the top), someone has graciously identified it with orange tape - one around a stick jammed into the ground, and one at eye level on a small tree. Both were very helpful, as we knew we had reached the critical juncture to leave the main creek. This is one I'm not likely to do again...but I proudly join the few who have made it! Thanks again to this blog, which I greatly appreciate. PS - no yellow jackets to be found anywhere today. I tried to find the falls last week and came upon a baby bear before I got to them. Needless to say I forgot about the falls and booked it out of there hoping that mamma bear would not come after me. Just thought I would let folks know to be careful! I completed this hike yesterday. Toughest hike I have completed, at least the last 1.5 miles, to and fro!Dang near busted myself slipping on the lose shale at the base. Found a baggie with above directions to the falls and a geocache as well. My next time will be to hike to a vantage point, where I can see the entire falls instead of just a small portion. I live on Clarkscreek and most of you have probably seen my house passing on the trail. Has anyone found the pool at the very top of the mountain? I think it's as cool as the falls. literally the top! Where is this pool that you speak of? Beyond the falls? Yes where is the pool? And when coming back down from the falls and back to the fork has anyone ever went on up clarks creek? thanks I was wondering where it would come out at? This is a beautiful trail and the creek is gorgeous. On the return trip we ran into a Timber Rattlesnake directly on the trail. Of course we all know they are out there, but it's important to stay vigilant and be aware of what is going on around you. Absentmindedly stepping on a venomous snake is a great way to ruin a hike. Anyone have accurate GPS coordinates? One the way to the falls are two very cool folds in the mountain. I used these as inspiration for the cave in my book THE LAZARUS SPEAR. There are a number of other AT sites included in the book. Read more at http://TomDeaderick.com/lazarus.